On a grassy hillside high in the foothills of Yangmingshan lies a small garden. An ornamental path leads past rows of miniature hedging and beds of flowers to the simple, dignified tomb of singer Teresa Teng, whose unique voice conquered fans the world over. Since her tragically early death in 1995, thousands of admirers have flocked annually to this secluded spot to pay their respects. For those to whom the name Teresa Teng may be unfamiliar, she possessed a singularly magical, silky voice and the same ingenue beauty of the late Karen Carpenter. 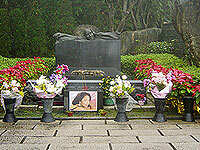 Teresa Teng's tomb is what brings most people to Jin Bao Shan (??? "Gold Treasure Mountain"). There are also the breathtaking views over the coast and the eastern mountains of Yangmingshan. Dominating the entire site is the great outcrop of rock that rises to the right of the main driveway. Craftsmen took eight years to carve this long, low bluff of richly colored sandstone into a maze of rocky trails, tunnels, small pinnacles and countless statues of Buddha, lotus buds and various deities, in imitation of the great rock-carved cave temples of mainland China. There is a path that descends into the earth, following a tunnel for a distance before emerging at a terrace and coffee shop, a great place to wind up your visit. Cemeteries may not seem likely destinations for a fascinating half day out, but Jin Bao Shan is definitely a noble exception. GETTING THERE: Follow the coastal road northwest from Keelung to Jin Shan, from where Ju Ming Museum and Jin Bao Shan are clearly signposted. Alternatively, take the road over the top of Yangmingshan to Jin Shan, although this route can be very busy on weekends. There is a direct (privately-run) bus service for visitors, leaving daily at 9 a.m. (reserve seats by phoning (02) 2516-6250). Ju Ming Museum Arts busses run daily (except Mondays when the museum is closed, at 8:40 a.m. and 1:10 p.m. weekdays, and at 9:30 a.m., 10:30 a.m. and 12 noon on weekends; tel. 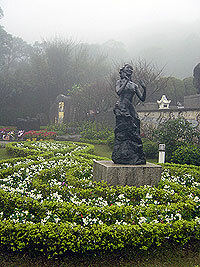 (02) 2498-9940) from outside Taipei Fine Arts Museum to Ju Ming Museum (near YuanShan MRT station). Walk up the hill from there to Jin Bao Shan.